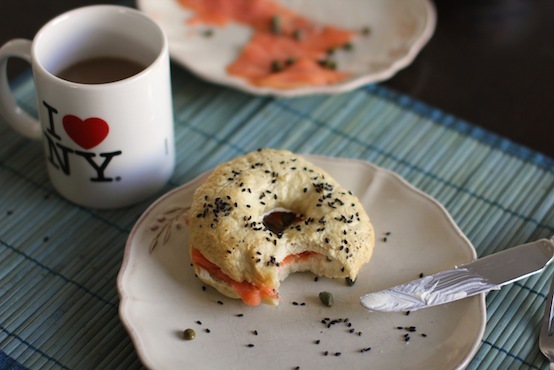 Hey, Lady Grey: Make your own breakfast bagels. Honestly it's easy! 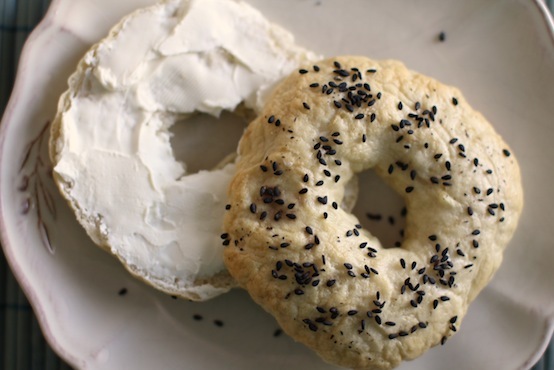 Make your own breakfast bagels. Honestly it's easy! This morning, I made homemade bagels. I know. I know. That sounds very ambitious. 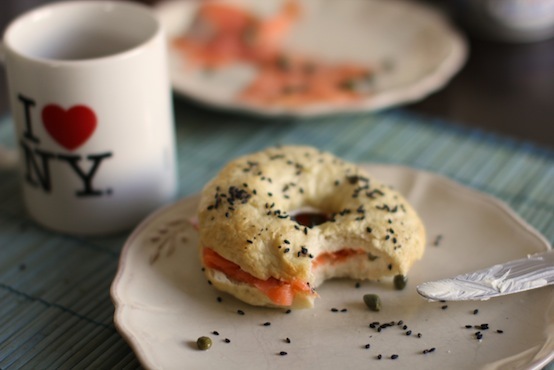 But we had some smoked salmon that needed to be used up, so we needed to have bagels. And since you can't buy fresh bagels up here in the north (let's face it, you can't really buy fresh anything), I thought to myself, why not make them? How hard can it be? Well, as it turns out, making bagels at home is easy. Honestly. It didn't take long at all. And most importantly they turned out amazingly! They tasted like actual real bagels! I was pretty impressed considering how little work they were. In a small bowl mix 1/2 cup of the hot water and honey. Sprinkle on the yeast, and set aside until frothy (5-10 minutes). In a large bowl add the flour and salt. Pour the yeast mixture into the centre and gently mix into the flour using a wooden spoon. Gradually add in the rest of the hot water until you have a sticky dough. Turn the dough out onto a floured surface and knead for a few minutes. Put the dough back into the bowl, cover with a clean tea towel and set aside for 20 minutes. Divide the dough into 10 equal sized balls, and flatten them slightly into a disk shape. Use the handle of a wooden spoon to make a whole in the centre of each disk. Twirl the bagel around the spoon handle until you have a large central whole, about 1.5 inches wide (it will close up significantly as it rises and bakes). 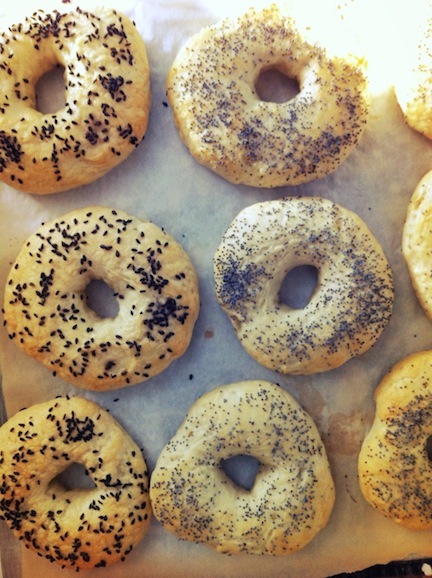 Place the bagels on a baking sheet lined with parchment paper and cover with a tea towel. Allow to rise for 40 minutes on the counter. Preheat the oven to 450 degreesF. Bring a large pot of salted water to a boil, then add in the baking soda. Poach the bagels, a few at a time, in the boiling water, 30 seconds on each side. Drain off the excess water and then sprinkle with sesame or poppy seeds. Place back on the baking sheet and repeat with the remaining bagels. Bake at 450 degrees F for 10-12 minutes, until golden. UM yes, i need to try this. thanks for sharing! you are the CHAMP Vanessa. Being away from modern day conveniences (like fresh bagels within arm's reach) is a good motivator to try to make things yourself! This does seem interesting, I also have been meaning to try to make english muffins, I saved a recipe years ago and it's still on my to do list. Cool!! These sound sooo good! I live in East Africa right now, and there are certainly no bagels here. We also have to make due with a little toaster oven for baking, and these still turned out great! Thanks for sharing your recipe.